Martha does it again! We're so thrilled to introduce you to our new Martha Stewart Crafts® Vintage Decor Paint with a fresh Matte Chalk Finish. The new formula means no prep work needed for your surface, and it dries with a beautiful matte finish. Or, you can distress or seal your project with Martha Stewart Crafts® Vintage Decor Wax in Clear or Antique. The charming palette of 22 traditional and stylish colors is perfect for furniture, home decor and craft projects, and to add even more personality to your projects, we also introduce our line of Martha Stewart Crafts® Vintage Decor Stencils! They make it simple to create beautiful painted designs on fabric, wood, glass, and other surfaces. To paint with ease, the ergonomically designed, easy-grip Martha Stewart Crafts® Vintage Decor Paint Brush is ideal for applying Martha Stewart Crafts Vintage Decor Paint or Vintage Decor Wax. 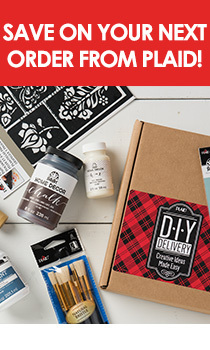 The line is available at Michaels, and to jumpstart your next project, get 25% off your entire regular price purchase of Martha Stewart Crafts® Vintage Decor Paint through September 12, 2014. See coupon for details and exclusions. Watch as Martha Stewart shares with you more about the line, see more project ideas on our website and visit our YouTube channel for more video tutorials!